Jose Fernandez struggled with his command, issuing four walks (one intentional), throwing two wild pitches and hitting a batter, but he also struck out nine to help lead the Marlins to a 6-1 victory Monday night against the Nationals, which snapped Miami's four-game losing streak and marked its first home win of the season. "As the game went on, my body started catching up with my arm and it was a lot better," Fernandez said of his early-inning struggles. 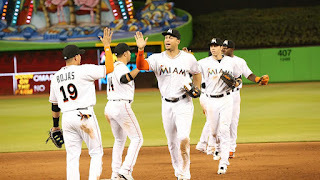 Giancarlo Stanton hammered his third homer of the season and plated a pair, while Marcell Ozuna had a two-run single off Nationals starter Tanner Roark as Miami built a 4-0 lead after two innings. The Nationals could not capitalize on an off-night for Fernandez, who threw 64 of his 103 pitches for strikes, but held the Nationals hitless through the first four innings. Michael Taylordelivered the Nats' first hit in the fifth, a one-out double, and he came around to score on a sacrifice fly from Bryce Harper, who had his streak of games with a home run end at four. That was the only offense of the day for the Nationals, although they had no shortage of runners on base, stranding 10 overall. "I think the positive is we had chances," first baseman Ryan Zimmerman said. "We put pressure on [Fernandez], and tonight he made some pitches. Hopefully next time we can do that again, he'll make some mistakes and we can capitalize." Changing speeds: Fernandez threw a curveball for a strike on Taylor and then came back with a 95-mph fastball to strike him out with the bases loaded in the second inning. Fernandez got into trouble by hitting Jayson Werth with a pitch and intentionally walkingDanny Espinosa to get to the pitcher, Roark, whom he also walked to load the bases. Fernandez worked into the fifth inning before his no-hit bid was broken up by consecutive one-out hits by Taylor and Anthony Rendon. Clutch hitting: Ozuna delivered a clutch two-out, two-strike single, scoring both Christian Yelich and Stanton in a three-run first inning to stake Fernandez to the early lead. Ozuna hit a 2-2 fastball up in the zone, lacing it into left field. Yelich, who stroked an RBI single that scored Dee Gordon with the game's first run, came home ahead of Stanton, who walked. "That was a huge hit," manager Don Mattingly said of Ozuna's single. "That got us going and we were able to get the win." Battling without his best: Fernandez was not the only pitcher who battled on the mound early. Roark had to do much of the same, starting in the first inning when the Marlins ambushed him for three runs to start the game. Roark settled in and was able to last six innings despite allowing seven hits and five runs (four earned) while issuing a pair of walks and strikeouts. "I mean, one bad pitch to Ozuna. That's about it," Roark said. "Everything else felt good. And then obviously the 2-0 fastball, I tried to go in on Stanton. I just didn't get it there. And when you make mistakes to guys like that, they hit the ball far." Roark showed an ability to last deep into a game where he might not have his best stuff -- a trait shared by other starting pitchers that has encouraged the Nats during the early portion of this season. The first of three reviews that all went in favor of the Marlins came in the second inning. Nationals second baseman Daniel Murphy lined a ball down the left-field line that was ruled foul, but appeared close to catching some of the foul line. The Nationals challenged, but the ruling after review was that the call stands. In the bottom of the inning, Fernandez tried to lay down a sacrifice bunt to advance Adeiny Hechavarria to second base. Nationals catcher Wilson Ramos fielded the bunt and attempted to throw Hechavarria out at second, and initially it was ruled that he did. But Ramos' throw pulled Espinosa off the bag at second, and the call was overturned and ruled a throwing error. Hechavarria would eventually come around to score. 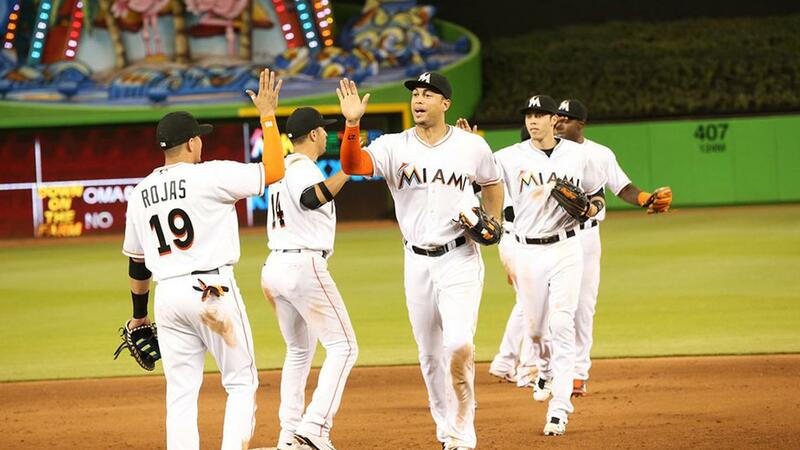 The Marlins gained another challenge as a result and used it in the seventh. Stanton drove in a run with an RBI single to right, but the throw from Harper to the plate was cut off and thrown to nearly catch Stanton at first. He initially was ruled out, however the call was overturned upon further review. Nationals: Right-hander Stephen Strasburg makes his third start of the season on Tuesday night at 7:10 ET against the Marlins. In his 12 starts since returning from the disabled list in 2015, Strasburg owns a 1.91 ERA and 103 strikeouts while holding opposing batters to a .186 batting average. Marlins: Lefty Adam Conley takes the mound for the Marlins on Tuesday in the second game of a four-game set with the Nationals at Marlins Park. Conley will be making his third start this season. He has yet to figure in a decision, but he worked six scoreless innings against the Mets in his last outing.